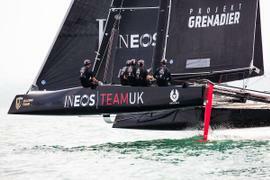 Britain’s America’s Cup team INEOS Team UK is to have its first official debut later this month at the 2018 GC32 Racing Tour. Led by four-time Olympic gold medallist Sir Ben Ainslie, the team’s 32-foot foiling catamarans will be put through their paces for the first time at the GC32 Lagos Cup in Portugal, the second event of the European tour. After the Lagos Cup comes to an end on July 1, the team will continue on the GC32 Racing Tour to compete at events in Spain in July and August, Italy in September and finally France in October. Skipper and Boat International columnist Ainslie said the racing circuit would be an important opportunity for the team “to get to grips with technique and boat handling”. He added that it will “put them in good stead” for when the America’s Cup World Series restarts in 2019. “We are looking forward to getting back out on the water doing what we enjoy doing; competing in a highly charged racing environment against some really tough competition and we can't wait to get going,” he said. Ainslie also added that the team are “under no illusion of the type of competition” they are up against. “The line-up of the teams and sailors is really strong,” he said. However, significant changes have been made to both the onshore and offshore teams since Ainslie's unsuccessful bid for the America's Cup in 2017. Olympic gold medallist Giles Scott returns to join Ainslie on board as tactician, the same role he undertook in the 35th America’s Cup. Meanwhile Australian Olympic gold and silver medallist Iain Jensen and two-time America’s Cup winner Joey Newton have joined as mainsail trimmer and jib trimmer respectively. “We've made some big changes to the team, both on and off the water, we've brought in some new key sailors who have vast experience in America's Cup and high-performance racing and they've been a great addition to the team already,” Ainslie explained. INEOS Team UK was launched in April to challenge for the 36th America’s Cup by Sir Jim Ratcliffe, founder of the chemicals group. It is hoped the £110 million challenge will see Britain bring home the sailing trophy for the first time since it was launched in 1851.